When I heard he was coming to town I was excited, of course. There are some individuals who are synonymous with Canada - and not just deceased prime ministers, either. 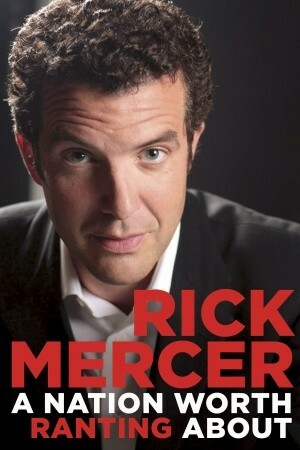 There are some who have become a part of the Canadian consciousness, icons of who we are and what we aspire to be - and Rick Mercer is one of them. I've been watching Rick for many years, long before he attained the level of fame he has now achieved. I have always wanted to see him live, and I was thrilled when Keyano Theatre announced he would be their performer at their annual "The Affair for the Arts" fundraiser. I must admit, though, I hesitated when the tickets first went on sale, simply due to time constraints, and I missed out. I was deeply disappointed but patiently bided my time in the hopes that more tickets would be released. I was delighted when two weeks ago I snagged one of a handful of remaining seats, and my spot at the event - and the evening - was secure. Just as Rick Mercer is synonymous with Canada in my mind so too is Keyano Theatre with Fort McMurray. Keyano Theatre has been part of my life since I first arrived here, and I have been there many times over the years. The Intrepid Junior Blogger has seen children's performers there when she was younger, and now that she is older she often attends plays and musicals with me. Theatre is such a fundamental part of life to me - the creativity, the excitement, the vibrant energy....well, to me it is one of the things that makes life pleasurable, and so to support the Keyano Theatre is to me simply to support a good life. And they made supporting it very easy this year, as The Affair for the Arts was stunning. The lobby was transformed once again into a upscale-gala venue, and when I walked in they handed me a program and an envelope full of wine tasting tickets. The wine tasting, hosted by the local Opimian Society, was a grand affair, allowing one to sample a variety of wines from around the world. There were far more tickets in that little envelope than I could ever use, but I sampled a trio of wines that I had never tried before (and even found a new favourite called "Houdini", a lovely little Chardonnay that could well become one of my new best friends). And then there was the food, an incredible variety that left the tables groaning under their weight (and me groaning when I could no longer eat another bite). Add to that the lovely silent auction items, the hundreds of well-attired attendees, and the general atmosphere of celebration and you had a wonderful event before Rick Mercer even took the stage...but take the stage he did, and Fort McMurray by storm. One of the things Rick is known for is his "rants", little tirades on a variety of topics. It's sometimes a call-to-arms kind of rant, and sometimes an angry spanking-of-the-politicians kind of rant. Regardless, though, it is sincere and genuine and impactful, and when Rick took the stage at Keyano Theatre he brought with him his presentation on "A Nation Worth Ranting About". More of a chronicle of some of his adventures than a true rant he took the audience through adventures in bungee jumping with Rick Hansen, and playing sports he had no business even attempting. He showed clips of his various forays into the Canadian culture, and he spoke about his work with organizations like "Spread the Net", a challenge he originally issued to universities to send money to Africa to buy netting to protect people from malaria-carrying mosquitoes (that challenge eventually went on to include all levels of schools, including elementary). He intrigued me most, perhaps, when he spoke of his "vote rant", a rant which inspired students across the country to form "vote mobs" and storm the voting polls in the 2011 federal election. I was intrigued because I think we need a vote mob right here in this community sadly known for abysmal turnout at the polls, and not just a youth mob, either. We need a full-scale voting riot, I think, and Rick made me think about how to make that happen. It was a wide-ranging talk, funny and engaging just as expected. I suppose I fount it poignant, too, touching when he talked about students who independently started the pink shirt anti-bullying campaign. And I suppose as he talked about his own experiences, about the opportunities his career has brought to him, it reminded me a bit of my own. You see tomorrow is the second anniversary of this blog. I always get reflective around this time, because there is no doubt that this little blog, this little collection of words on a website, changed my life. My experiences might be far less impressive than Rick's (I won't be experiencing zero gravity any time soon, for instance) but one thing I have learned is that this world is a place full of incredible people and chances. Every single event I have gone to, every single person I have met, every single moment of this journey has changed me. I have had experiences I will never forget. And it was all because I began to say "yes" when I was asked if I wanted to try something instead of "no". It all began because I decided to embrace the world of possibilities - and I think that is something Rick Mercer does, too. Rick Mercer is a proud Canadian, genuine and authentic and sincere. I suspect he does not think our country is perfect, and so on occasion he rants. He rants because he knows we can make this a better place. And so too I am a proud resident of this community, one that is far from perfect but perfect for me. It is perfect because of the imperfections, because true beauty isn't in the flawless but in the slight flaws that give a place character.Perfection is highly over-rated, and in fact it is non-existent. What does exist, though, is a desire to make something better when you love it, and a desire to embrace this life and all the opportunities it offers. This past weekend I once again embraced this community, and this world of opportunities. I sat in a darkened theatre and watched a Canadian icon speak of his experiences in this country, and I thought of my own experiences in this community. I forgot for a time about my growing mountain of unfinished laundry and my strangely numb lips (something I originally thought had to do with a reaction to one of the wines and only later realized was due to a plumping lip-gloss that made my lips feel less like Angelina Jolie and more like one of those goldfish with the bizarrely engorged lips). I simply got lost in the moment, and stopped thinking about anything outside those theatre walls, as I so often do when I am there. It was a moment of pride, and reflection. It was moment of gratitude for places like Keyano Theatre, places that enrich my life here, and for people like Rick Mercer, who inspire me to continue to say "yes" to life. It was one of those treasured memories along the journey of this life. To Rick I say thank you for coming to Fort McMurray. To Keyano Theatre, the staff, and all the volunteers I say thank you for bringing arts and culture - and passion - to Fort McMurray year round. 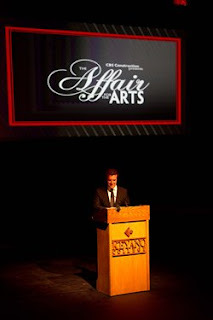 To the sponsors of The Affair for the Arts I say thank you for helping the theatre to do what they did once again on Saturday night - transport you to a place far away from laundry and numb lips, and into the realm of memory and possibility. 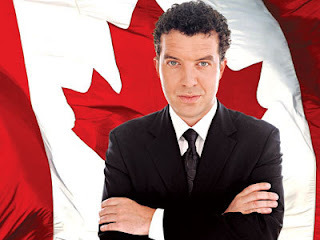 That is what a theatre should do, and once again, just as they always do, that is what Keyano Theatre did when they brought Rick Mercer to town for a little rant. As a former resident of Fort McMurray, long before Keyano Theatre was a glint in some thespian's eye, I wish to commend everyone involved in having the good sense to have brought Rick Mercer to your town. No one (except perhaps for Rex Murphy) speaks for Canada quite the same way. You are indeed fortunate in having shared his rants/musings! Happy Bloggiversary! What a cool opportunity to see Rick Mercer! And I agree with you, we need those "voting riots"! Happy Tuesday!